Many commentators have described the conditions currently facing the UK newspaper market as a 'perfect storm'. The increasing share of advertising budgets taken by the web, rising print prices and a recession are combining to put pressure on printed news as never before. "All newspapers are being buffeted by a number of forces, not least the digital revolution, which is competing for attention and sucking advertising, especially jobs advertising, out of print. If fewer people buy newspapers (and our bit of the market has shrunk 9% over the past six months) that's less revenue. If, because of a tough economic climate or changing technologies, fewer people advertise in print, that's less revenue still." I'm not going to try to claim I have the answer to these problems. However a trend is emerging in the digital versions of our traditional news outlets, which I'm certain is not the answer. I reviewed the excellent Flat Earth News a while ago and that book makes a fantastic case for the churnalistic echo chamber that our news outlets have become. If one paper reports a story, then all can report it as fact, referencing the first that ran it. If it's sourced from a wire service, it's gospel and need not be checked, even though wire services are under huge financial pressure themselves and so are cutting back on their own checking. Traditional news outlets are trying to use their presence on the web to position themselves as a higher quality source of information and debate than social media. You'd expect more reliable information and a better standard of debate from The Guardian or the BBC, than you'd find on Twitter. It's a sensible strategy. Unfortunately, cost cutting and a desire not to miss out on information that people can source from outlets like Twitter is also seeing their quality eroded. At the moment, this is largely visible in news outlets' Live Blogs. Take this example from the BBC's football transfer deadline day coverage. Transfer deadline day is very much silly season for rumours, but if I want pure speculation, there's plenty to be found on Twitter. If the BBC's only bringing me the same speculation I can find elsewhere, then what is its purpose? 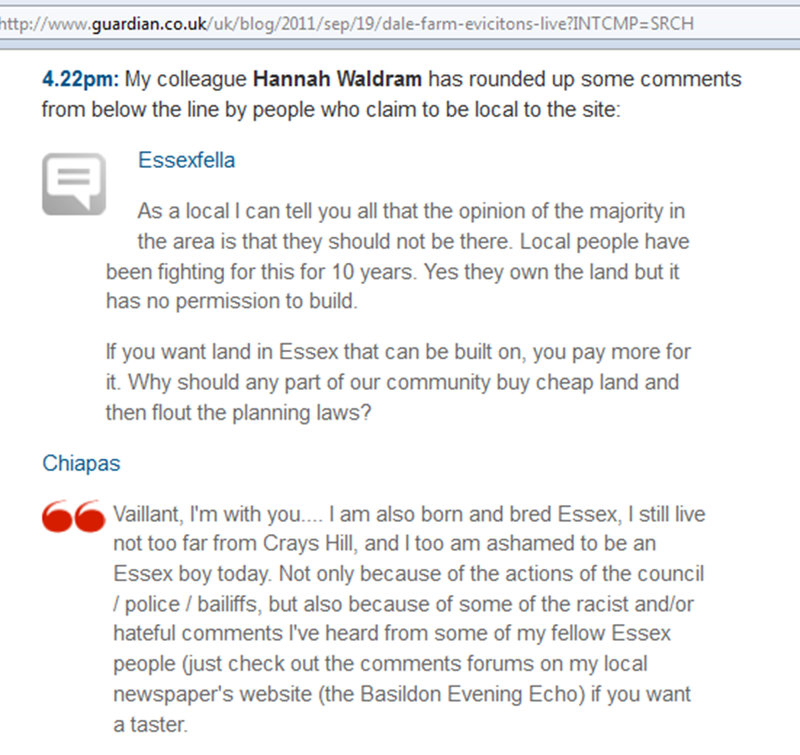 An example on a more serious story appeared on The Guardian website yesterday in their coverage of the Dale Farm eviction case. 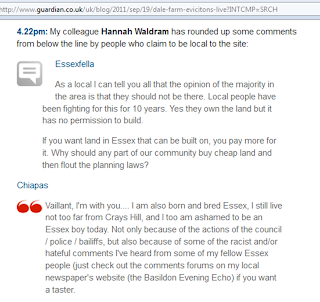 Several commentors on the article (inlcuding me) had argued that even though plenty of reporters were present at the site, we'd heard very little from local residents' on their opinions of the planned eviction. Plenty from lawyers, politicians, celebrities and the travellers who live on the site; almost nothing from their neighbours. Eventually, the writers of the Live Blog cobbled together a few opinions from people commenting on the article who 'claim to be local to the site'. It was a weak solution to an element of the story that the reporters could see they needed to cover. Crucially, it's only the relatively low volume of comments on Wallpapering Fog that stops me from doing exactly the same thing here. If I hit any one of the multitude of current affairs forums and nicked a bit of content, I could do exactly the same thing here. For The Guardian to stand above social media, it needs to do more. It's a small symptom of a growing problem. When our news outlets just serve commentary that they've sourced unchecked from social media, what is their purpose? I can visit social media directly and I can't easily check the claims made there either. This sort of tactic will work for a while as organisations like The Guardian are able to live on their reputations, but gradually, those repuations are being eroded. Like a brand that becomes addicted to price discounting, they buy cheap sales now, at the expense of the future value of the company. Our traditional news media need to cut costs and to adapt, but if they don't set themselves apart from social media by differentiating on quality then they'll have no future at all.